Based on the novel Nobi by Natto Wada, the original, 1959 film, instigated much controversy in the west, for its grotesqueness and the fact that it portrayed Japanese soldiers as victims. In Japan, however, it was immediately hailed for its anti-war message and artfulness, winning a number of awards in local festivals, before Locarno also netted it the Golden Sail for Best Film in 1961. However, through the years, the film was recognized globally, and is currently considered a masterpiece. Shinya Tsukamoto presents a low-budget (the film was produced through his own company Kaijyu theater), gorier take on the story of a Japanese soldier trying to survive during the last days of the war, as the Imperial Army retreats in disorderly fashion. The soldier’s name is Tamura, a low-level soldier who suffers from TB, and is kicked out by both his commanding officer and the doctor in charge of the field hospital, who has his hands full with injured soldiers on the brink of death. 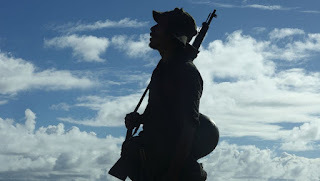 When a bomb destroys the hospital completely and all of the people in it, Tamura is left alone, and begins his own odyssey of survival, trying to stay alive in an utterly hostile environment, where the search for food has become the ultimate goal of every Japanese soldier left on the island. In his “journey”, he enters a catholic church, stumbles upon a local couple, and eventually finds three soldiers from another company, consisting of a corporal who claims that bullets cannot him, and Nagamatsu, a young man completely attached to the third member of the trio, a half mad elder soldier. The corporal informs him that they are to retreat to the port city of Palompon, and that gives a ray of hope to Tamura, at least until the food lasts. 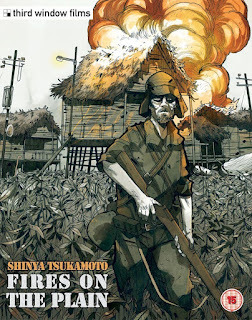 Shinya Tsukamoto does not shy away from the grotesqueness of war, with his splatter past showing its face from the beginning of the film, where the doctor in the hospital “operates” on the wounded. This trait extends to the whole of the movie, through images of decaying bodies, soldiers being shot, and as Tamura’s downward spiral of Tamura continues, to scenes of anthropophagous individuals. Tsukamoto may focus on the shocking aspect of his theme a bit more than needed, but the anti-war message of the film remains more than evident: War can strip people of every human trait, as the struggle of survival turns those involved to complete animals. Tamura, who is revealed as a writer before joining the war, seems to differ from the majority of the soldiers around him initially, who have lost almost all sense of compassion. However, as his odyssey continues, madness also embraces him, and his basic instincts take over. 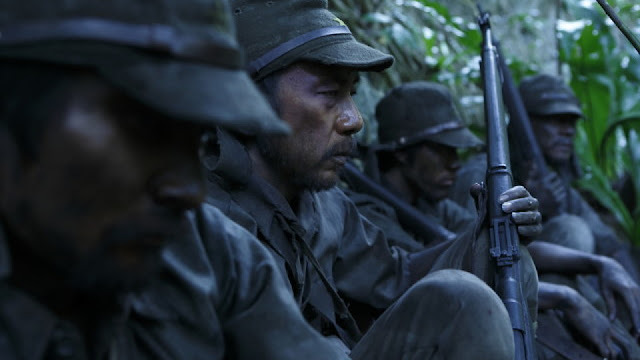 Tsukamoto used a digital camera to shoot this firsthand account of the hell of war, and through his almost completely linear narrative, which is occasionally interrupted by Tamura’s hallucinations, presents a film that functions as a combination of a grotesque documentary and a surrealistic music video, despite the almost total lack of music. This last aspect derives mainly from the editing (also by Tsukamoto) with the use of jump-cuts and the occasionally neurotic change of angles and scenes, which is somewhat reminiscent of “Tetsuo”, although in a significantly less extreme fashion. Continuing his one-man show, Tsukamoto also stars as Tamura, playing a character who looks almost stupefied by what is occurring in front of his eyes, and rarely revealing what is going on in his head. Lily Franky is great as the older soldier, emitting a dangerous paranoia from a character that does not need to act upon it, in order for those around him to understand. “Fires on the Plain” is not a masterpiece, but the extremity in the presentation of the anti-war message definitely sets it apart as a cult spectacle that fans of the genre will definitely appreciate.